Na’aleh’s First Shabbat in Israel! Our Na’aleh adventure started in rainy Northwood, New Hampshire, where we stayed for two days. After having a great time because of the agam, camp food, and Bil, the day finally came for us to travel to Logan Airport, the Laguardia of Boston. Saul A. had the lucky opportunity to be pulled aside by security while the rest of us got to be questioned by attractive Israeli agents. After a 20 minute delay, we got on the plane. 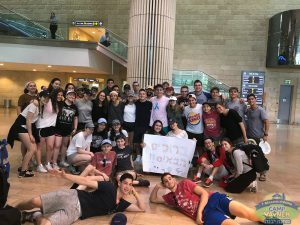 Besides Adina, who was upgraded to business class, and Shanie, who was sandwiched between two Chassid’s, the rest of us were peppered amongst a sea of YJ kids in coach. All of us made it safely to Israel except for Money’s carry on, which was completely doused in hot sauce from a broken bottle. Luckily, most of it was sponged up by his brand new Na’aleh siddur. Now, to the holy land! At our first stop in Jerusalem, we were led blindfolded to the Mount Scopus overlook, where we had a quick l’chaim and enjoyed the spiritually arousing view. After checking into the Montefiore Hotel and taking much needed showers, we gorged ourselves on a delicious Israeli feast. The next day, we ventured through Hezekiah’s tunnels, where water was above our knees. While Shai was squatting and Lily was drowning, the rest of us made our way through the tunnels, either with lights, or singing beautiful zmirot in terrifying darkness. Afterwards, we had lunch at a mall, where we bumped into Amiel buying groceries, and then we headed back to the hotel for naps and showers. Later, we had “meet the madrichim” in a local park. Avi, our Israeli madrich, was a competitive gymnast, Avigail, our Israeli madricha, plays the Persian violin, Fivel, our tour guide, has lovely peot, and Or, our shomer, has a cool gun. After another nice dinner at the hotel, we went into Jerusalem for a light festival, where we launched each other on light up seesaws and played the floor in lava on color changing platforms. On Friday, we toured around the Temple Mount in the old city, and had lunch in the Jewish quarter, where we cooled off in the lukewarm shade. Looking forward to a relaxing Shabbat in Jerusalem. To see some photos from their first day in Israel, click here. If you need the password, email Erin Statter, Marketing and Communications Specialist.